It all started when I saw the beautiful tuna steaks in the supermarket. I couldnt resist them so I bought, albeit with eyes half-closed because this fish could get a little pricey. But heck, we’re treating ourselves tonight because all work and no fun makes us dull…. yep, good food is fun, especially the kind that you don’t have to feel guilty about after having wiped out your plate. And this dish fits the bill (no pun intended). I love fish, and if you’ve read my previous blogs, I grew up in the Philippines having the freshest fish from the Pacific Ocean. (Just an observation, I think the seafood from the Pacific Ocean taste much sweeter than those from the Atlantic… in my opinion). Anyhow, we try to eat fish once or twice a week. First , because I’m not really a big meat eater (Mr. J is, though), and second, because of all the nutrition that you can get from them (Omega 3 acid, most especially). 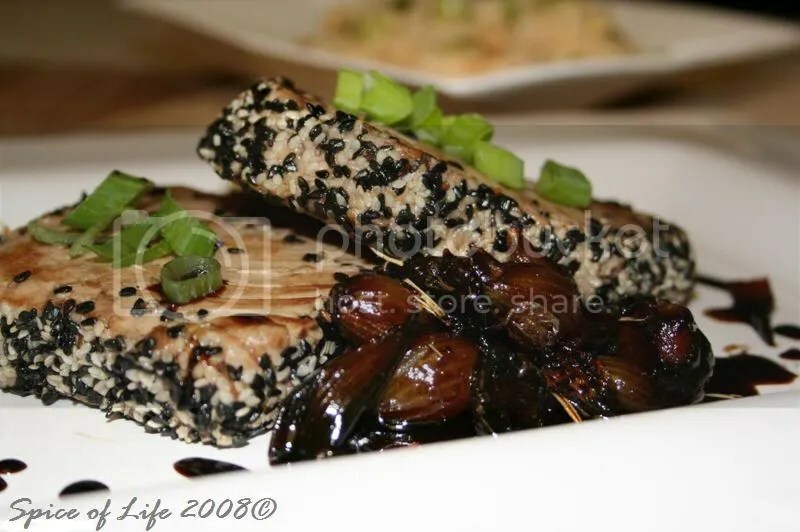 I have made this dish before, but this time I just dressed up the tuna a little bit with the black and white sesame seeds. 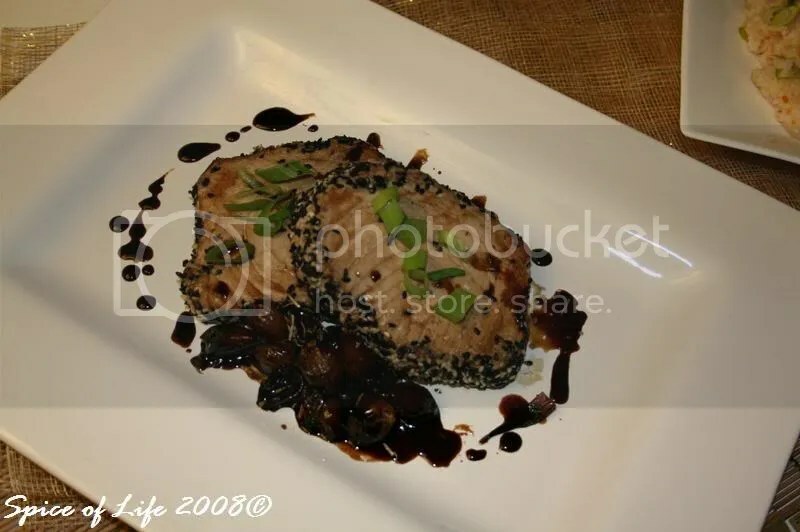 Honestly, as much as I love fish — I can’t say which one I love better in this dish- the tuna or the cippolline onions in balsamic reduction. I think they go oh so well together that one cannot be without the other. I served this this with a Peanut-Ginger Rice (see recipe in my next blog). 1. Combine tuna , soy sauce and lemon juice in a bowl, tossing gently to coat. Sprinkle tuna with salt and pepper. Go easy on the salt because the soy sauce is already salty. 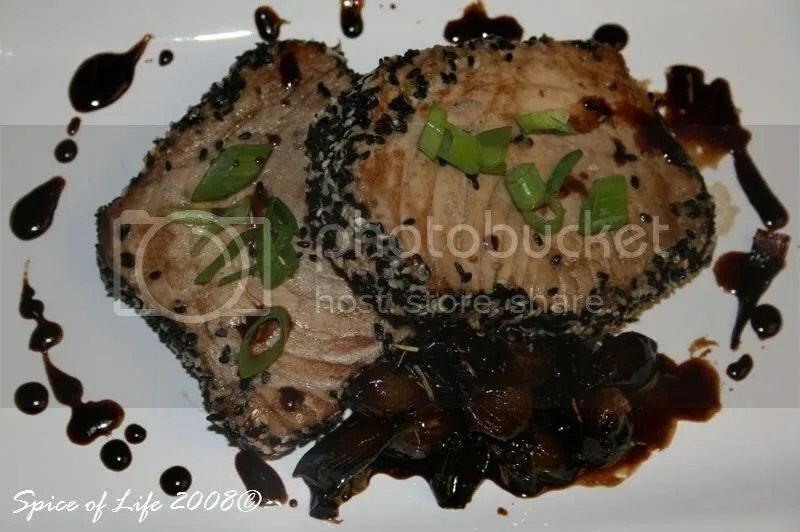 Let tuna marinate for a few minutes. 2. In the meantime, heat oil in a large , non-stick skillet over medium high heat. 3. 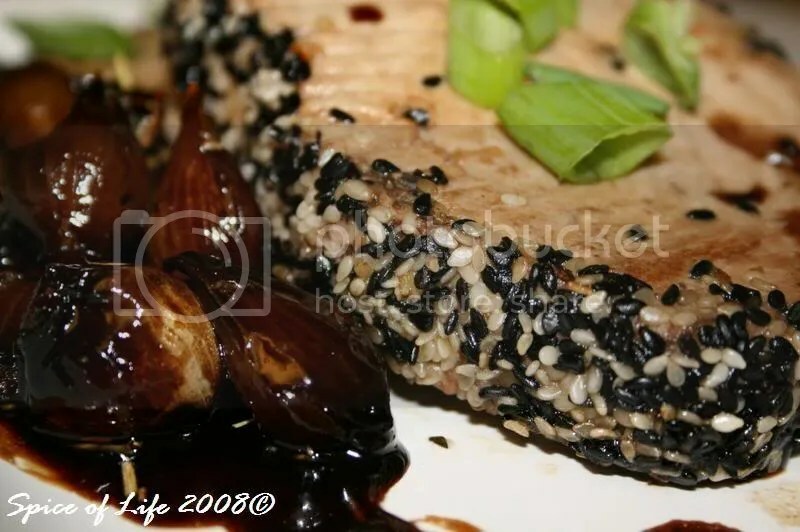 Dredge the edges of tuna in sesame seeds. 4. Add tuna to pan and cook until desired degree of doneness. 5. Serve tuna with the cippollini onions (recipe follows) and peanut-ginger rice (recipe following this post). *NOTE: If you want your tuna cooked rare, buy sushi-grade tuna. 1. Bring a large pot of water to boil. Add the onions and cook for 2 minutes. Drain and cool. Peel the onions and cut off the root ends. 2. Preheat the oven to 400 degrees F.
3. Toss the onions, vinegar, oil, honey, salt and pepper in a baking dish. 4. Roast in the oven until the onions are tender and golden, stirring occasionally, about 40 minutes to 1 hour. 1. Get the onions to the oven first as this takes the longest to cook. 2. 20 minutes before the onions are done, get the rice started. 3. 10 minutes later, start on the tuna. By the time tuna gets done, the onions and rice should be done and just waiting to be served.